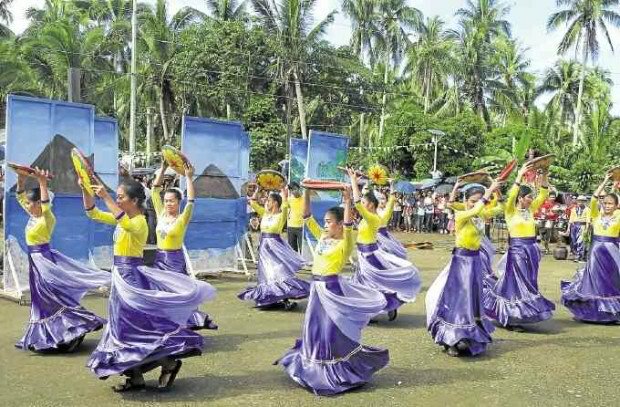 MAGALLANES, SORSOGON—Maria Borton, 78, had a recurring dream: Two Agta warriors are dancing in her yard and later disappear like mist on the same spot before she wakes up. She related her dream to Dr. Francisco Datar, an anthropology professor at the University of the Philippines (UP) College of Social Sciences and Philosophy sometime in the 1980s, when a number of burial jars were dug up in her neighborhood. 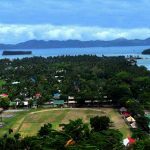 Datar, a native whom she calls “Totoy” (little boy), was then leading a group of researchers from UP that was conducting a community survey in Bagatao, a 500-hectare island separated by a 500-meter wide channel adjacent to the town center of Magallanes in Sorsogon province. Borton asked him to dig up her yard because she sensed that something was hidden there. The team agreed and to their surprise, they found 15 burial jars, aligned in a row, on the spot where the native warriors disappeared in her dream. Some jars yielded human skeletal remains, but these crumbled and were never recovered intact. Some skulls and jaw bones were salvaged, as well as the stone slabs that served as jar covers. Datar said Bagatao had been inhabited before the Spanish colonizers arrived, as evidenced by burial jars unearthed near its coast. “The pre-Hispanic settlers live in the inner part of the island where pieces of pottery and porcelain were found. 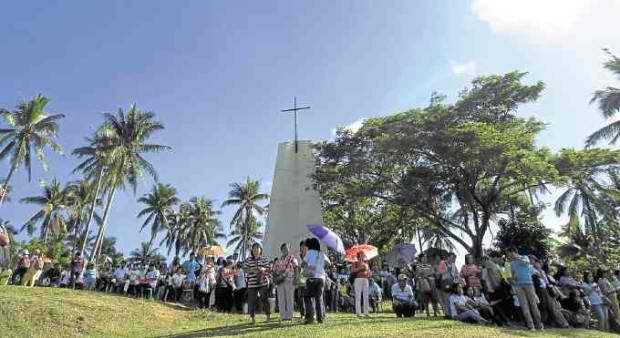 The burial grounds were near the beach,” he said. A summer ago, an islander called him and reported about artifacts accidentally dug up while a toilet was being built in a property there. Datar said he was told that the stone slabs had symbols that read like “HO U,” prompting the resident to say, pun intended, that pre-Hispanic settlers used present day text message language (“Hu u?”/Who [are] you? in text message). Unfortunately, when Datar got hold of the slab, the scripts were unreadable because local children had pelted it with stones. Datar recalled another instance when his team first visited Bagatao and was told a story by a resident who found a sealed small jar inside a bigger burial jar. When the small jar was opened, a sheet with scripts was discovered, but it crumbled to powder when they tried to shake it out of the jar, he said. 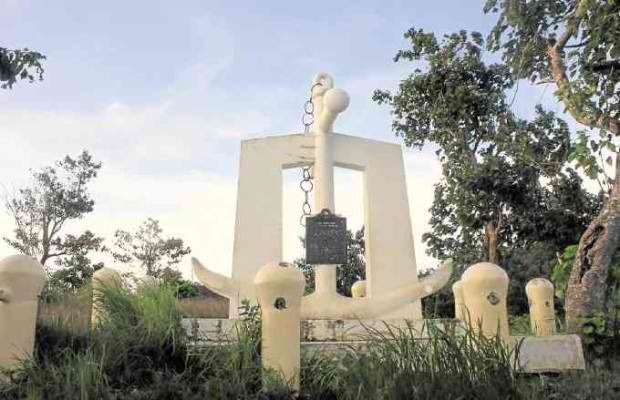 At the northern point of the island, a concrete monument of an anchor by the National Historical Institute (now the National Historical Commission of the Philippines) marks Bagatao as the shipyard of galleons used in the Manila-Acapulco Trade. Established by Governor General Juan de Silva in 1610, the “Astillero de Bagatao” lasted 146 years building galleons, the biggest of which was Santísima Trinidad, the marker says. 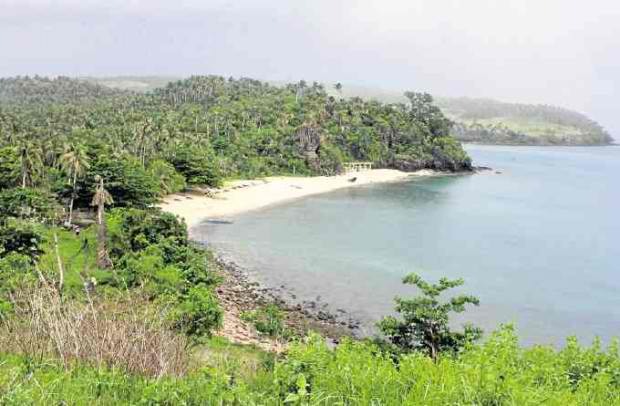 “Bagatao Island was a suitable site for a shipyard in the 17th century because of the existence of timber, a nearby port, a launching platform and a well-protected terrain,” said professor Danilo Gerona, a Bicol historian who holds extensive primary data gathered from the Spanish archives. 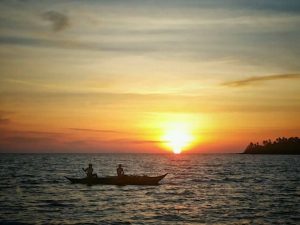 The island is along the main route of galleons at the well-secured mouth of Sorsogon Bay, a busy waterway from 1610 to 1814, Gerona said. The Astillero de Bagatao, he said, was “a vital cog” in the existence of the Spanish colony in Manila. “While all other shipyards produced galleons of various tonnage, none excelled those built in Sorsogon,” he said. Gerona said the shipyard did not only build galleons used for trading but warships as well, like the San Felipe and Santiago, which were used in the battle against the Dutch from 1616 to 1617. 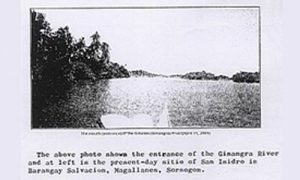 The grandest galleon built in the archipelago was the Nuestra Señora del Buen Socorro, which was finished on Aug. 28, 1667 on the order of Governor General Diego de Salcedo. Gerona said the last grand galleon built, the Santísima Trinidad, came from the Bagatao shipyard in 1751 and made her maiden voyage to Acapulco. 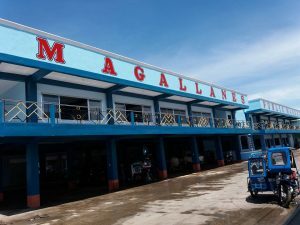 Using what was similarly spoken in Tabaco City in Albay province, the language in Magallanes had been shaped by workers transported here to build galleons, Datar said. 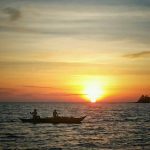 The unique development of the local language, through the influence of shipyard workers from Tabaco, distinguished the Magallanes tongue from other Sorsogon languages, which were heavily influenced by the Visayan language, he said. 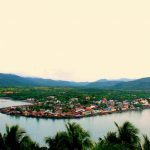 “For example, locals do not use ‘asin’ for the word ‘and,’ but ‘buda’ like the way it is used in Tabaco and many Albay towns,” he said. Datar said most of the nouns and verbs of the dialect used in Magallanes are similar to those used in Tabaco. Magallanes (population as of 2010: 35,443) is also important to the history of the Roman Catholic Church in the country. 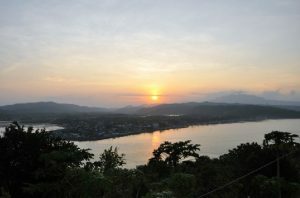 More than 10 kilometers north of the town center lies a village called Gibalon, where the first Mass on Luzon Island was held. 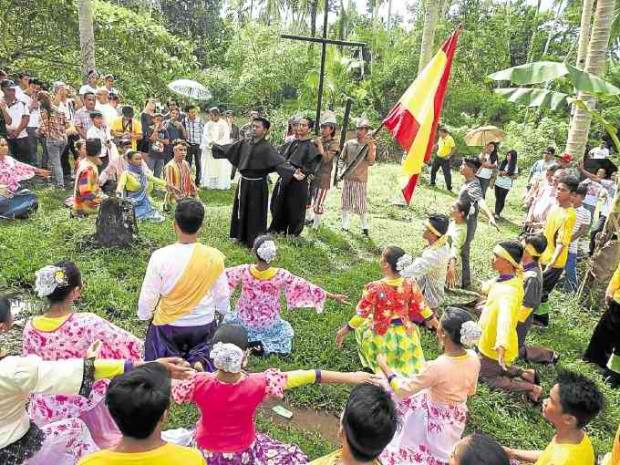 Marked by a stage and a towering cross on a hill, Fray Alfonso Jimenez, an Augustinian missionary, celebrated the first Mass in Luzon in 1569, Gerona said. He said Jimenez was a native of Malaga, Spain, who took his vows at an Augustinian convent in Mexico in 1558. He later traveled to the Philippines and stayed first in Cebu province. 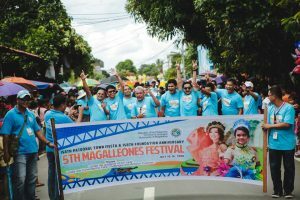 Gerona said Jimenez was appointed to serve as missionary to the islands of Masbate, Leyte, Samar and Burias, where he preached and converted the natives to Catholicism. He said the friar was cited by the 18th-century Augustinian biographer Fray Agustin Maria de Castro for converting and baptizing a chieftain and 49 of his children on Burias Island before he proceeded to Gibalon. “After baptizing many, he (Jimenez) went to the village of Ibalon (Gibalon), in the province known to the Spaniards as Camarines. 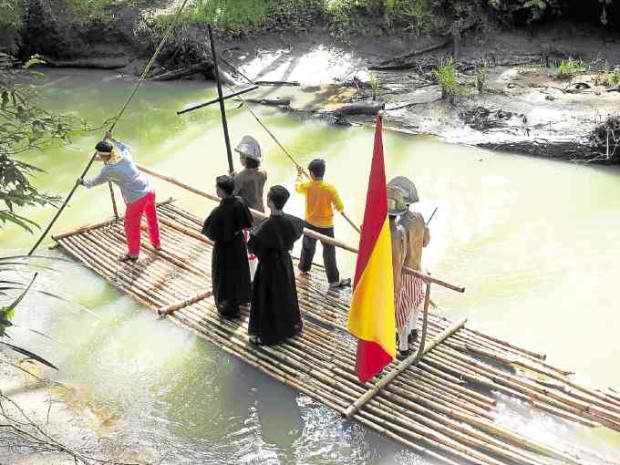 It was in this village where a Mass was held, which a number of local historians regarded as the first ever celebrated on Luzon soil,” Gerona said.